Teaming up again with I Will Be producer Richard Gottehrer, plus additional influence from Raveonettes guitar wiz Sune Rose Wagner, He Gets Me High finds Dum Dum Girls blossoming with seismic guitars, chiming harmonies and front woman Dee Dee finding her voice. The quartet has widened their sound tremendously — you’ll hear the increase in sonic production instantaneously. It’s an effortless progression from the jagged 1960’s-influenced girl-group pop that marked their excellent debut album, but it also feels like such a natural and obvious progression. There’s a noticeable balance, and realization, of studied pop music existing between the guitar melodies, loose rhythms and vocal delivery that brings to mind the sunny Paisley Underground-era pop band The Bangles and the guitar crunch of Tanya Donnelly’s outfit Belly. Not bad company to be in. The fiery opener “Wrong Feels Right” streaks at a pace akin to much of the material found on I Will Be only the emotions conveyed are sexier. The guitars expand with choppier, jigsaw movements that thicken the song as it follows Dee Dee’s sultry coo. Title track “He Gets Me High” unveils the best payoff and vocal performance on the record with overdriven guitars and a casual delivery yearning for a loved one. 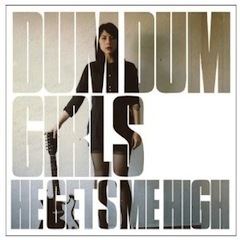 Dum Dum Girls are a brave bunch and love to cover the music of their peers. So this time they tackle The Smiths “There is a Light That Never Goes Out”. The quartet squeeze the melancholy and sadness evoked in the original and unveil a dangerous version that’s more exciting but still depressed — can’t escape Moz’s wordy self-loathing. “Take Care of My Baby” wouldn’t feel out of place on an album like I Will Be but the melody and twangy guitar line also happen to have just as much in common with an act serenading a crowd of broken hearts at the Grand Ole Opry. Easily the best song they’ve recorded. Nice. Thank you for that one. Totally agree with chuckp – now looking forward to checking out the lp.